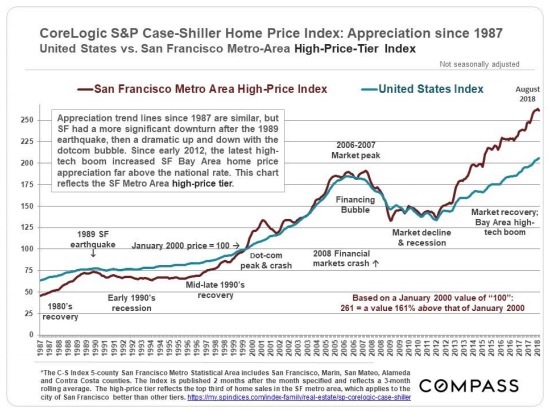 The CoreLogic S&P Case-Shiller high-price-tier Home Price Index for the 5- county San Francisco Metro Area, illustrated above by the blue line, applies best to more expensive Bay Area housing markets such as most of San Francisco, Marin, San Mateo and Diablo Valley/Lamorinda. 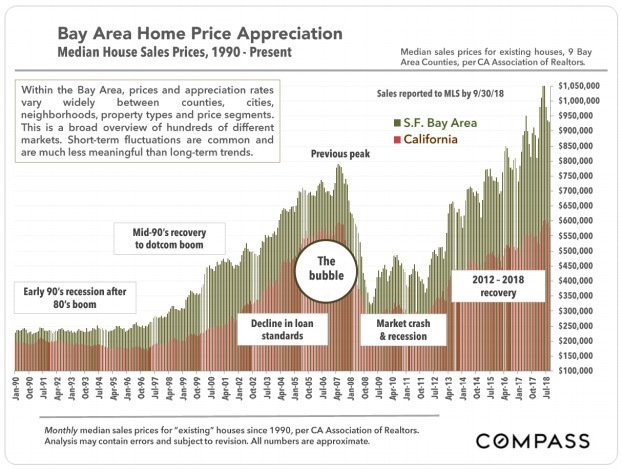 The SF Metro low- and mid-price tiers had much more dramatic bubbles and crashes in 2005-2011, but as of December 2017, have ended up at points a bit higher than the high-price tier. The green line tracks home price appreciation for the United States as a whole. 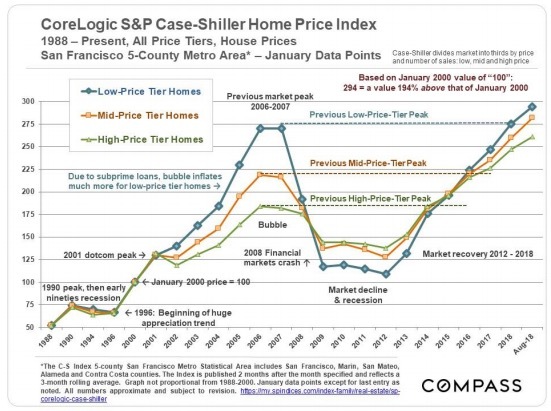 The Case-Shiller Index is predicated on a January 2000 price of 100. “250” signifies a price that has appreciated 150% since January 2000. Financial-market cycles have been around for hundreds of years, from the 1600’s Dutch tulip mania through our recent speculative frenzy in crypto-currencies. Though cycles vary in their details, their causes, effects and trend lines are often similar, providing more context as to how the market works over time. Our smartest experts can’t get it right, much less the thousands of glib, confident forecasts by utterly unqualified individuals reported on in the media every month. We can’t even remember the mistakes of the recent past – one reason why we don’t seem to be able to escape the curse of recurring cycles – much less foretell what’s going to happen tomorrow. Which leads to the next point. It is extremely difficult to predict when different parts of a cycle will begin or end. There is no rule regarding how long the different parts of a market cycle will last. Boom times, even periods of “irrational exuberance,” can go on much longer than expected, or get second winds, with huge jumps in values. On the other hand, negative shocks can appear with startling suddenness out of nowhere, often triggered by unexpected economic or political events that hammer confidence, adversely affect a wide variety of market dominos, and then balloon into periods of decline and stagnation. These negative adjustments can be in the nature of a bubble popping, the slow deflation of a punctured tire, or some combination of the two. Going back many decades, all the major Bay Area recessions have been tied to national or international economic crises. Considering the fundamental strengths of the local economy, absent a major natural disaster, it is unlikely that a major downturn would occur due simply to local issues. However, local issues can exacerbate a cycle: The 1989 earthquake intensified the effects of the national recession in the early 1990’s; our greater exposure to dotcom businesses produced a spike up and down with the NASDAQ bubble & 2000-2001 crash; and our current, raging high-tech boom has poured fuel on our up-cycle during the current recovery. All bubbles are ultimately based on irrational exuberance, runaway greed, criminal behavior, or all three mashed up together. Whether exemplified by junk bonds, stock market hysteria, gorging on debt, a corporate Ponzi-scheme mentality, an abandonment of reasonable risk assessment, and/or incomprehensible and dishonest financial engineering, the bubble is relentlessly pumped bigger and tighter. Whatever the phase of the cycle, many people think it will last forever. Going up: “The world is different now, profits don’t matter, and there’s no reason why the upward trend can’t continue indefinitely.” And when the market turns: “Homeownership has always been a terrible investment and the market will not recover for decades.” But the economy mends, the population grows, people start families, inflation accumulates over the years, and the repressed demand of those who want to own their own homes builds up. In the early eighties, mid-nineties and in 2012, after about 4 years of a recessionary housing market, this repressed demand jumped back in – or “exploded” might be a better description – and home prices started to rise again. Then kept rising as consumer confidence returned; ultimately moving into over-confidence and irrational exuberance. The nature of cycles is to keep turning. 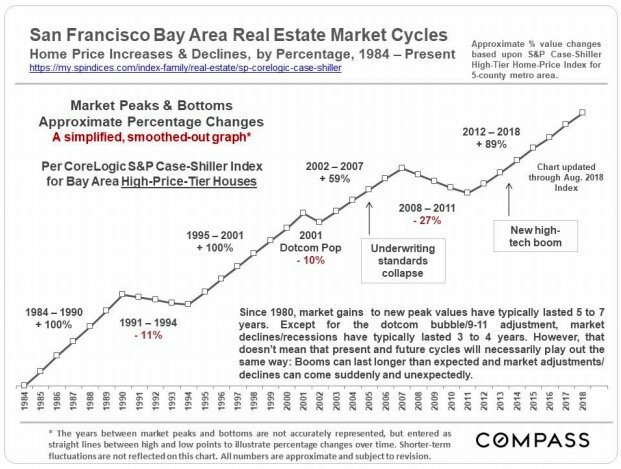 As long as one doesn’t have to sell during a down cycle, Bay Area homeownership has almost always been a good or even spectacular investment (though admittedly if one does have to sell at the bottom of the market, the results can be painful). This is due to the ability to finance one’s purchase (and refinance when rates drop), certain tax benefits, the gradual pay-off of the mortgage (the “forced savings” effect), inflation, and long-term demographic and appreciation trends.